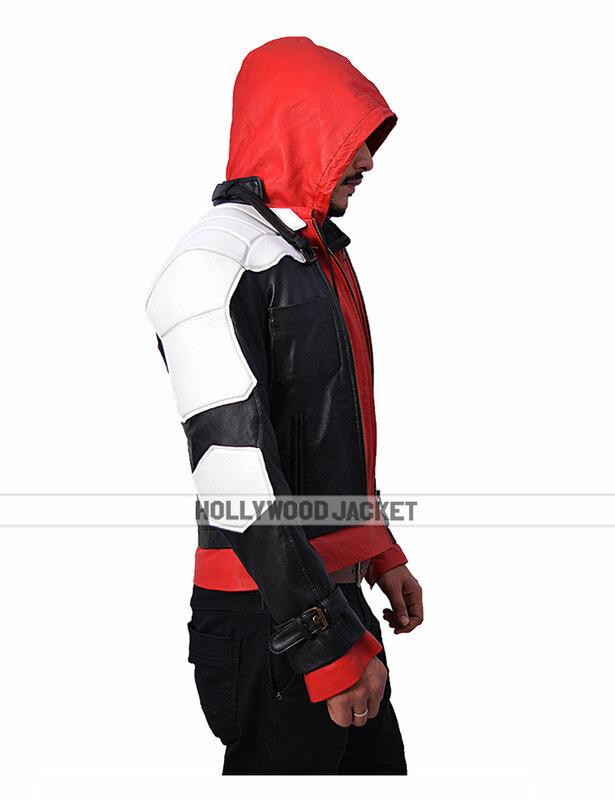 The intense black and Red Hood Hoodie is here with all the maneuverings modified with aptness. The ideal attire right from the Arkham Nights. The details are in-depth to the original tailored one and doesn’t seem to end till the border stitching. Precisely, our needlework men have once again created a genuine masterpiece, which can be acclaimed to be the most accurate design extracted straight out from the Batman Arkham Knight game. Also, the jacket is integrated with a detachable red hoodie as well. Altogether, the jacket is vest is your win-win situation. Now let’s start the real deal here when it comes to consolidating the Arkham Knight outfit in mere words. Inspired by the one and only Gotham City’s Batman, the picture-perfect Arkham Knight Red Hood Jacket is made with genuine faux leather like no other. The inner fabric finesse has been webbed with first-rate viscose lining to let you synchronize with all your gestures and moves. A logo realistically embedded on the chest to let your breath boost-up to the fullest. Moving on, the white quilted shoulders mark the harmonized prominence straight out from you, go on and whack and smack in full swing with your swankiness. A huge Batman dress dweller if you want to know more, the collar is belted style and the familiarity has been dedicated to the buckled sleeves as well. Overall, an enigmatic ensemble for you. Additionally, the Jason Tudd’s outfit has carefully revamped to make it as possible proximity to the one you guys see in the CGI play sensation. And this is the sole reason, our needle masterworks has also manufactured the Red Hood Vest. The material used for the Vest is the same used for the jacket in order to essential its unequaled correspondence. One or two metal rivets are inculcated to increase the vibrancy volume straight out of the jacket receptacle. Moreover, the sleeveless splendor is harnessed with padded design together with a Batman Logo. Adding to the updated structures, a lace up formation is made on sides of the waist to let you fit suitably along with a full zip closure. Go on and view are apparel authenticates. You’ll be eagle-eyed glued to our personifying produce. Mark my words! What to mention about it when you can observe it, right? The dress-up elite has everything to give it all to you. The looks, the persona, the walks, the movements, you name it. An incredible body merchandise created to accomplish your cosplay goals to the extremes. Whether you’re at Comic Cons, Halloweens, or in any other similar occasion. You won’t be forgotten until some years or until there’s someone who’d buy from us next year. And of course we hope it’s you again. This is an authenticated real deal. Let the world know your clothing realness up to the mark. This is the ideal Batman Arkham Vest to solidify your comic-famed personage with great precision. Super stunning. Satisfied!!! The Red Hood jacket got that blood red color appeal and the astute stitching was really superb and even exceeded my deepest of expectations. Oh yes definitely going to impress my friends this time and I certainly suggest this buy to other serious readers here taking note of each and every detail in order to make the right decision. The borderlines were entrenched with a great stitch method and made me ascertain of its longevity wear composure. …woah!!! awesome guys really and I assure there’s gonna be no headache or tear gushes whatsoever after such a genuine double treat buy. The best part of it all was the steel plated chest part of the vest that really amplified the overall cover up to a whole new level. The red hoodie collar was also great and added a certain respect and rectitude to the overall ensemble. Everything was designed as mentioned on the website. Immaculately built, yielding standards a very topnotch body gear to spend your hard earned money on. Recommend this to all!!! 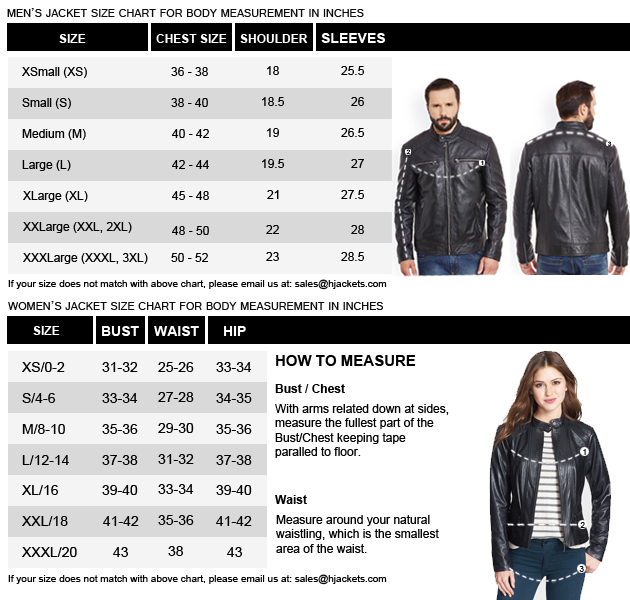 5/5 jacket and vest without any bogus on making and specifying on the website. Pitch perfect!! Awesome Red Hooe Jacket!!! WOW wearable really!!! Awesome Red Hooe Jacket!!! WOW wearable really!!! 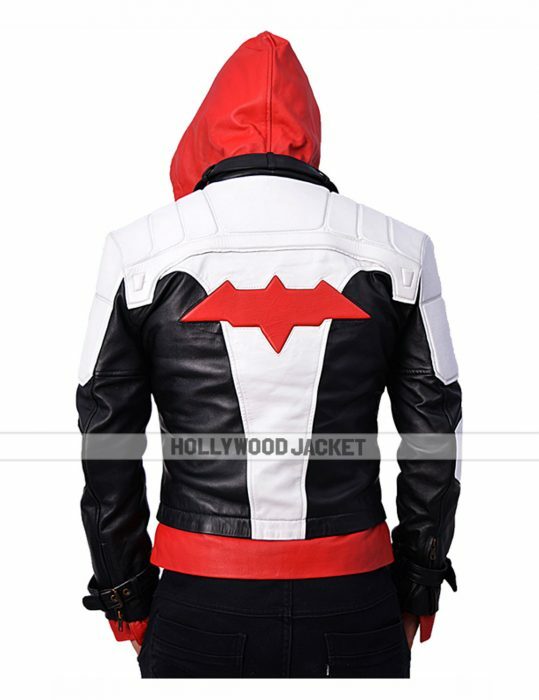 Great garment and depicts the Red Hood uniform to exactness. Good quality faux leather and details as per mentioning on the site. My 5 6” 144 lbs body was best fitted with the M version of the jacket without any hesitations. Looking to revisit this store that has such immense quality and determined leather improvising. My favorite one was the vest. Well done guys!!! Awesome Red Hood wearable for the cost. Awesome Red Hood wearable for the cost. I am surprised to get such a detailed jacket and vest out of the box. The outfits were fresh and could smell the real leather drafting out of the upper shell (I ordered it in the real cowhide coz its awesome)… always wanting original renders perform on the jackets I greatly admire out of their stunning appeal scheming and excellent ensemble edifice. The size measurement I was thinking of to go with a small version, but I eventually redirected my decision towards going for the medium design amid having a generous garment appeal even when looking to dress up smartly for the winter’s season. My chest size was a bit edited though and I had received expertise from the website… and I was impressed of their sheer spot on verdict. Couldn’t be proud more than the day I received this remarkable attire. Incredible and good quality overall. Fantastic piece I was searching for the jacket with vest for an impressive look in front of the viewers. 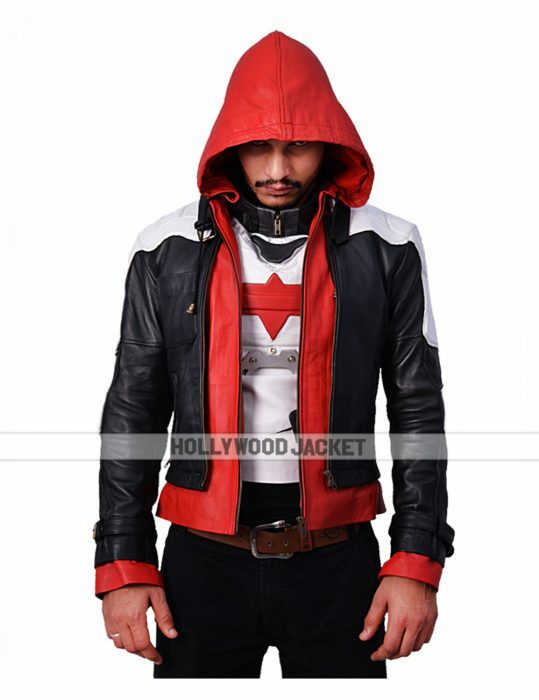 Then I found the red hood hoodie jacket that was looking really amazing. I ordered it immediately for me and my cousin both. When I received my parcel, I was really happy to see the classiest product on the affordable rates. Best price, best quality and the best product that I have never seen before. I would highly recommend this product.